The GSM Association on Monday announced the expansion of its regional office in New Delhi with its relocation to Connaught Place, one of the largest financial and commercial centres in the city, to support the growing mobile market in India. The GSMA is a trade body that represents the interests of mobile operators worldwide, uniting more than 750 operators with over 350 companies in the broader mobile ecosystem, including handset and device makers, software companies, equipment providers and internet companies, as well as organisations in adjacent industry sectors. 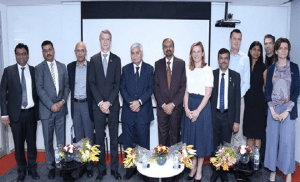 The inauguration ceremony of the new office held on October 25 was attended by GSMA Director General Mats Granryd and Dr R.S. Sharma, Chairman of Telecom Regulatory Authority of India (TRAI). Honourable Minister of Communications (I/C) Manoj Sinha joined the ceremony via video conference. Many other government dignitaries and senior mobile industry executives also attended the ceremony. With nearly 750 million unique mobile subscribers, India is the second largest mobile market in the world, accounting for 15 percent of the global subscriber base. Over the next several years, India will be a major driver of mobile industry growth in the Asia Pacific region and globally and is set to reach nearly 920 million subscribers in 2025. “Since we established our first presence here in 2012, we have witnessed tremendous change in the Indian mobile landscape,” said Manoj Misra, Senior Public Policy Director, GSMA. With 5G networks set to launch in India in 2020, Misra said that the GSMA is playing a vital role in driving collaboration across the industry and with regulatory authorities to ensure that India can fully capitalise on the potential of 5G. The GSMA said that the association and its members engage closely with the Department of Telecommunications and TRAI to ensure a regulatory environment that will foster investment and fuel innovation, focusing on key issues such as spectrum for mobile broadband, mobile taxation, network planning and privacy and data protection. Beyond these critical public policy initiatives, the GSMA said, it is focused on accelerating digital and financial inclusion across India through its Mobile for Development organisation, working with members to deliver services in areas such as Mobile Money, mAgriculture, mUtilities, mHealth, Connected Women and Disaster Response, among others. The GSMA also supports its members through industry programmes including Future Networks, Identity and Internet of Things. The new GSMA office also supports the growth of the organisation’s GSMA Intelligence platform and data services, with nearly 20 developers and analysts based in Delhi. Previous articleIs Apple Trying to Make iPhone a Premium Product Again?